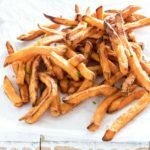 Air Fryer Sweet Potato Fries are crispy on the outside and flaky on the inside. Peel and cut each sweet potato into even 1/4 inch thick fries. Mix olive oil and salt and toss the sweet potato fries to thoroughly coat. Preheat air fryer to 400F / 200C / Gas 6 and lightly spray the air fryer basket with cooking spray. Cook in batches (one layer), between 8 mins (thin fries) – to 14 mins (thick fries), flipping the fries half way through the cooking time. Air fryers vary in temperature so start with a small amount of sweet potato fries. Add just one layer of fries to the basket for cooking and make sure fries are not touching. Cut uniform chips to cook all fries evenly. For even cooking turn halfway through to allow even cooking on both sides. You can buy an already cut prepackaged sweet potato at the store if short on time. There are 3 Freestyle Points in a serving of Air Fryer Sweet Potato Fries.